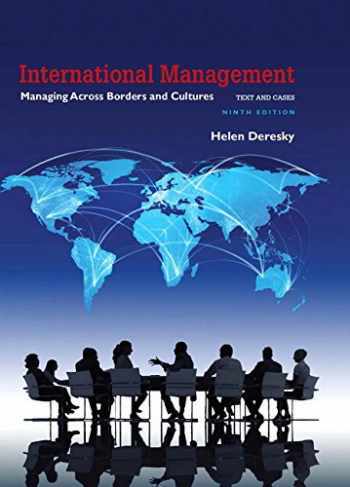 Acknowledged author Helen Deresky wrote International Management: Managing Across Borders and Cultures, Text and Cases comprising 504 pages back in 2016. Textbook and etextbook are published under ISBN 0134376048 and 9780134376042. Since then International Management: Managing Across Borders and Cultures, Text and Cases textbook received total rating of 4 stars and was available to sell back to BooksRun online for the top buyback price of $82.00 or rent at the marketplace. For courses in international business, international management, and general management. International Business is conducted around the globe across cultures, languages, traditions, and a range of economic, political, and technological landscapes. International Management: Managing Across Borders and Cultures examines the challenges to the manager’s role associated with adaptive leadership and thoroughly prepares readers for the complicated yet fascinating discipline of international and global management. No matter the size, companies operating overseas are faced with distinct scenarios. In order to be successful, they must accurately assess the components that shape their strategies, operations and overall function. The Ninth Edition trains readers and practicing managers for careers in this evolving global environment by exposing them to effective strategic, interpersonal, and organizational skills, while focusing on sustainability.